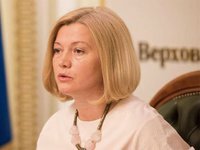 Representatives of the Russian Federation in the humanitarian and economic subgroups of the Trilateral Contact Group (TCG) to resolve the situation in Donbas have thwarted the meetings that began in Minsk, First Deputy Chairperson of Ukraine's Verkhovna Rada and Kyiv's representative in the humanitarian subgroup of the Trilateral Contact Group Iryna Gerashchenko said. "I've just received information from Minsk from my colleagues: the Russian side, through artificial reasons, disrupted a meeting of humanitarian and economic subgroups. Representatives of the Russian Federation refuse to work in a trilateral format in the OSCE, blackmail Ukraine with a demand for "direct dialogue with ORDLO," and are waiting for the results of the elections in Ukraine, enthusiastically catching signals about "autonomy," the trip of the future president to Donetsk and Luhansk occupied by the Russian Federation and other pro-Kremlin nonsense. It smells like revenge," wrote Gerashchenko on her Facebook page on Wednesday. Earlier, the Ministry of Foreign Affairs of Belarus said on its Twitter that a meeting of the subgroups of the Trilateral Contact Group (TCG) on the settlement of the situation in Donbas had begun in Minsk on Wednesday afternoon.